The slope beside this luxury residential complex was deemed too steep and unstable for natural grading. The owners and Landscape Architect needed a green, economical solution to the site’s problems. Steep, clayey slopes made machine access difficult. 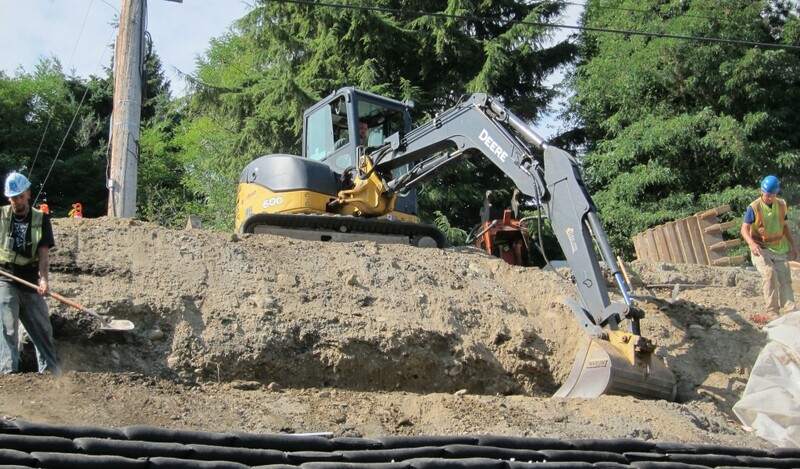 Drainage was installed throughout the slope to control wash outs. Four of five of the engineered walls were installed without geogrid. 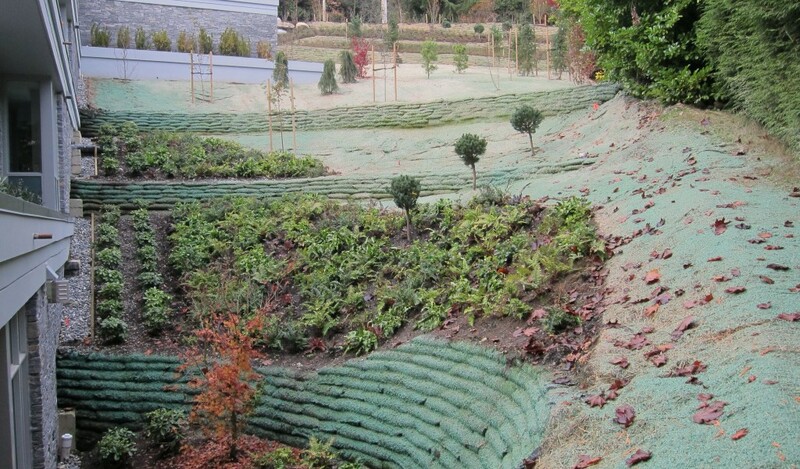 The walls were hydroseeded with a custom blend and terraces were live planted. The finished slope will green up slowly through the mild coastal winter, and be fully vegetated by late spring. Machine access was also quite difficult, with minimal excavation being preferred. Geotechnical engineers often recommend Flex MSE in tough to access areas, and the system proved ideal again for this site. Due to the overall height of the slope drainage was put in throughout, and irrigation added to select areas to maintain a lush aesthetic. 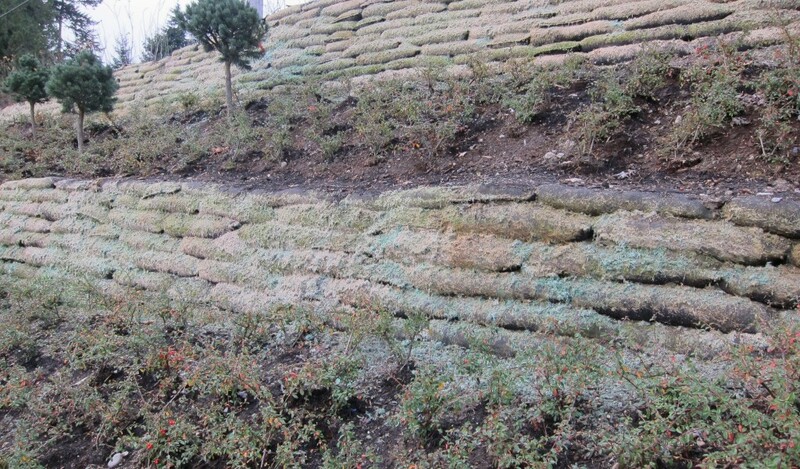 The walls were hydroseeded with a mix of fescues, creeping grasses, clover, and wild flowers that was developed specifically for the system by one of our experienced consultants. This installation is a great example of the strength, adaptability and ease of installation of Flex MSE and is highly deserving of being a Premier Featured Project. The mountainous shores of West Vancouver, Canada make for very dramatic views and lush plant growth. But they can present challenges to homeowners looking to increase their usable space. This homeowner’s back yard was originally only a steep slope and posed long term erosion issues for him and his neighbours. Rocky soils and limited access made heavier concrete systems more expensive and impractical. 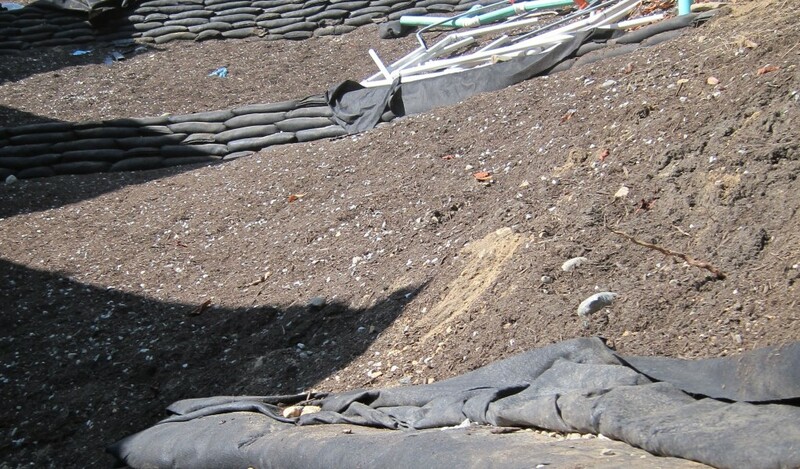 After commissioning a design, he set to work building a four level terraced vegetated slope that is an amazing illustration of the Flex MSE Vegetated Wall system’s strength and beauty. 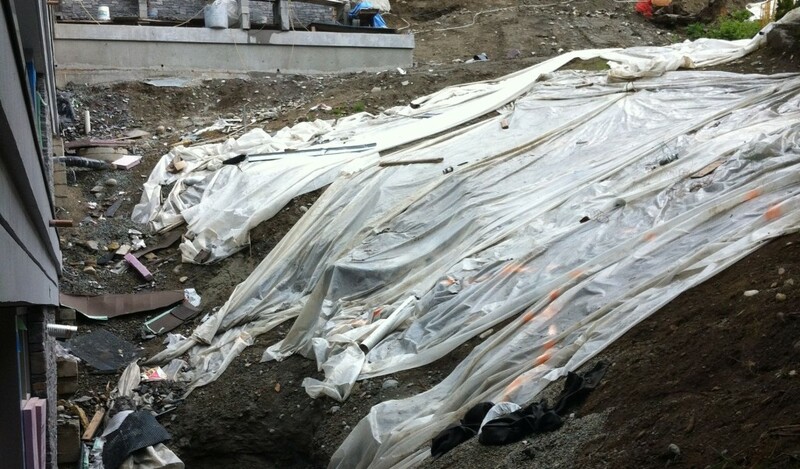 The Homeowner filled the Bags onsite using a Flex MSE Filling Table and built the walls on his own in his downtime. Sedum, native grasses, kinnickinnik, and strawberries were planted directly into the upper level Bags, while the lower levels were live planted with ferns and hydroseeded with a shade loving grass seed mix. Although the wall has irrigation, it is rarely needed thanks to the well planned planting scheme. The end result is a marriage between the natural surroundings and the owner’s distinct style that has transformed his yard from a six foot wide strip to a full lawn his entire family can use. If you’re interested in having your installation appear as a Featured Project please contact us.